Tokyo Tempest is a stylish top-down shoot-‘em-up in which Hikaru attempts to save a futuristic Tokyo from the Yakuza’s drone horde. The year is 2048. The Yakuza has subjugated the city through force, using its drone horde to keep the city under its control. Hikaru, a rebellious, brooding youth from the streets of New Tokyo, discovers that he has powerful elemental storm abilities after being struck by lightning from a strange storm that rolled over the skies of Japan. Upon this discovery, Hikaru realizes he is strong enough to face the Yakuza menace and is now attempting to save the citizens of New Tokyo from the Yakuza’s authority, even though doing so puts his life in incredible danger. The limited screen space of a mobile device greatly affects the size of the artwork for a game. It was a balance of making the artwork understandable while also trying to be able to add more elements to the game. For a bullet-hell shooter, many elements such as projectiles, enemies, and the player need to be on the screen at once. Finding that balance early on is important for this style of game. If projectiles are too big, the fun for the player to avoid the bullets may be lost because they will only be able to avoid a few due to the limited play space. If projectiles are too small, the player may have a hard time seeing the bullets, which we did not want to happen. The size of the enemies needs to be just right in order to give the player fun challenges. Too large of enemies means fewer on the screen and the game could become trivial, as Hikaru would not have to move very much in order to eliminate the enemies. Too small of enemies could make it too difficult for Hikaru to destroy the enemies. In addition, this opens itself up for more enemies on screen, which could prove to be too difficult if too many enemies are close together. If the Hikaru is too large, the player does not need to move Hikaru as much, thus making the game trivial and not as fun. If Hikaru is too small, there is a possibility that the game could become too easy because the player would be able to avoid the bullets easier. 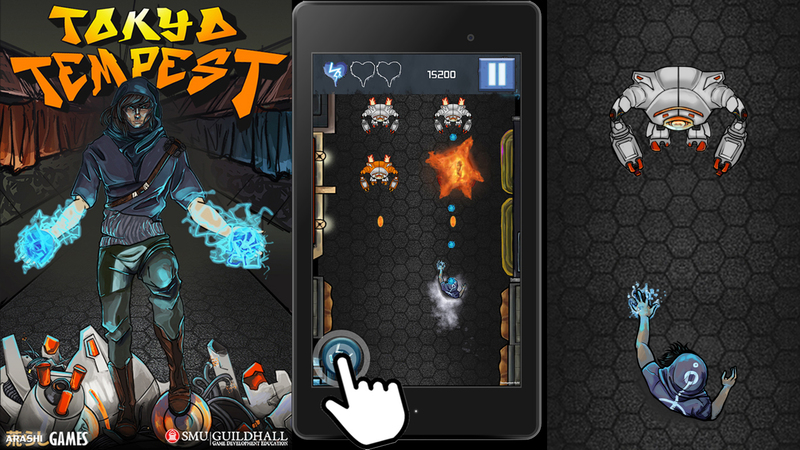 Overall, the balance of the artwork scale is extremely important for a bullet-hell shooter on a tablet/mobile device. The size of all artwork must be balanced together in order to make the game fun and still have the game make sense in terms of what is expected. When the size of one gameplay element is changed, it affects everything and the game needs testing to see if the change was in the direction the designers were wanting. Precision movement is another challenge we faced due to the limited screen space and inaccuracies of touch controls tablet/mobile devices provide. Movement is the core of Tokyo Tempest. We made movement as simple as possible for Hikaru by making him follow the players finger when pressed against the screen. This method is very intuitive for players and worked out great for the game. At one point in time, we considered an on-screen joystick, however, after researching and playing mobile games that used this feature, we found that it was much more inaccurate and hard to use than the method of following the players finger. Since movement is the core of our game, we found that finding the right scale of Hikaru greatly influenced how the good game felt. As we decreased the size of Hikaru, the harder it was for the player to precisely move Hikaru exactly where they wanted to on the screen. Although avoiding bullets became a bit easier, the player did not feel like they had full control, which we did not want. When we scaled Hikaru to a larger size, the player felt like they had more control of where they moved Hikaru on the screen. Of course, this influenced the rest of the balance of the game and we had to account for that. Tokyo Tempest is an endless runner that presented many challenges for balancing difficulty and the progression of the difficulty. There were so many variables available to balance the difficulty and the progression in Tokyo Tempest. We had 3 different enemy drones that shot projectiles in different patterns. We had 12 different chunks that we designed with different layouts containing these enemy drones and a static barrier hazard. Enemy drones had their own shooting delay and health. All enemy projectiles had the same damage amount. If an enemy projectile hit Hikaru it would cause Hikaru to lose a life. Hikaru constantly shoots Lightning Balls and Hikaru had variables for projectile fire rate and projectile damage. Lastly, since Tokyo Tempest is an endless scrolling game, we had a scrolling speed variable. With all those variables, gameplay balance for difficulty and difficulty progression was exceedingly difficult. The most important lesson learned was that we need to always keep our intended player audience in mind when designing the balance. To combat this major task of making Tokyo Tempest fun and balanced, we implemented a leveled progression of choosing gameplay chunks. We designed the gameplay chunks and then we grouped them into either easy, medium, or hard collections. To start the game, the player only interacts with chunks randomly selected from the easy collection. When the player survives the game for 30 seconds without losing a life, the medium gameplay chunks collection is added to the randomly selected chunks. And the same as the medium progression, the player progresses to the hard collection of chunks after surviving the medium and easy chunks for 30 seconds without losing a life. There are a few other variables being calculated in order to choose whether or not particular gameplay chunk collections are selected from, but that is the basic design we ended up with. In conclusion, the gameplay progression was the hardest challenge we faced for Tokyo Tempest. The best thing designers can do is to plan out the size of the game they are intending to develop and then schedule plenty of time to balance the game one section at a time. Focusing on making the easy chunk collection fun before even adding the medium chunk collection would have been advantageous to gather more playtest data for designing the progression and overall gameplay. Another major challenge designing Tokyo Tempest was the players hand and fingers blocking the view of the screen. Since our movement required players to be always touching the screen and guiding Hikaru, it blocked the view of some of our gameplay visuals. To tackle this challenge for the character, Hikaur, we gave an offset to his position when the player touched the screen. So when the player touched the tablet, Hikaru snapped above the touched location. Using this method, the player was always able to see Hikaru on the screen. This allowed players to more easily control the character and avoid enemy projectiles and barriers. For the other user interface (UI) features of Tokyo Tempest, we placed them in locations that the player would usually be able to see. The number of lives Hikaru had left, the player’s score, and the pause button were placed at the top of the screen since a majority of the time, the player played at the bottom of the screen. The Lightning Chain skill button was placed at the bottom left of the screen for easy and quick access to the player’s finger. We wanted to make this button as easy as possible to press, while also not allowing the player to accidentally press the button. Placing it in the corner proved the most effective way for Tokyo Tempest. The players were still able to see the button a majority of the time as their hand or arm did not block it at all times. When the Lightning Chain skill was available to use, the button flashed and animated to get the players attention. 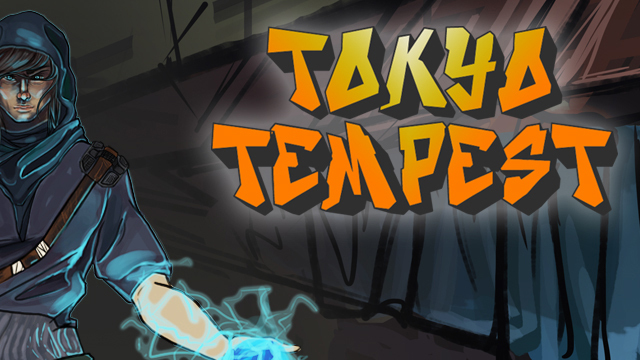 Designing Tokyo Tempest was a fun and challenging project that taught us all many things that we can carry onto developing other games. We will remember to think about the design challenges of artwork scale, precise player movement, gameplay progression, and the player physically blocking the screen when designing for tablet/mobile devices.